Darryl Tweed clinched a double at the Manx Grand Prix as he won the Ultra-Lightweight race on Friday. The Ballymoney man, who also won Wednesday’s race, maintained his form as he opened a lead of almost seven seconds by Glen Helen on the opening lap from Steve Moody, with Mike Carter almost four seconds further back in third. Tweed’s opening lap of 105.839mph gave him a commanding lead of over 30 seconds from Moody with Tom Snow (103.193mph) holding third ahead of Daniel Ingham and Alex Sinclair. Sinclair and Moody elected to pit at the end of the opening lap, moving Andrew Cowie and Mike Carter ahead of them into the top five. Ulsterman Tweed made his stop at the end of the second lap, but with Snow and Cowie electing to run through, Tweed’s lead was down to 13 seconds at Glen Helen on the third lap with Ingham and Sinclair completing the top five. However, Tweed had more in reserve and a final lap of 103.026mph saw him secure his second Ultra-Lightweight victory by almost 30 seconds from Snow, with Cowie sealing the last rostrum position. 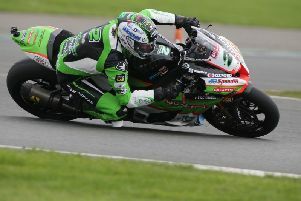 Ingham was reported as a retirement on the last lap at Joey’s, which saw Sinclair move into fourth with Moody completing the top five. In the concurrently run Lightweight race Skerries man Andy Farrell also wrapped up a double following his victory on Wednesday. The race was decided on the final lap when leader James Chawke – who won the Junior MGP on Wednesday – was forced out at Ballagarey as he held an advantage of more than 50 seconds. That left Farrell in the lead with a narrow gap of three seconds over Gary Vines, who in turn was less than half-a-second ahead of Dave Butler. Farrell upped the ante over the Mountain and a final lap of 114.650mph was enough to give him victory by six seconds over Vines, with Butler three seconds back in third. He said: “I lost a lot of time at the bottom of Bray Hill on the first lap when I had to shut off behind Victor (Lopez Santos) but I just kept hammering on. David Lumsden was fourth, while newcomer Michael Rees impressed as he slotted into fifth. Paul O’Rourke was taken by airmed to Noble’s Hospital following an incident at the Bungalow where he was reported to have sustained hand and hip injuries. Alan Thomas suffered a leg fracture after he came off at Greeba Castle. As the Manx Grand Prix reached a conclusion, the Senior race provided a fitting finale as Yorkshireman Matt Stevenson made amends to toast victory after crashing while leading the Junior race earlier this week. Stevenson joins an illustrious list of former Senior MGP winners including Harold Daniel, Doug Pirie, Geoff Duke, Phil Read, Nick Jefferies and Ryan Farquhar. There was plenty of drama though, with Stevenson almost ruining his chances when he incurred a 10-second penalty for refuelling with his engine switched on. He had to dig deep on the fourth and final lap as he battled to overcome a 12-second deficit to Stephen Parsons, who disputed the lead with Stevenson on the opening laps. Parson’s lead was down to over five seconds on the last lap at Glen Helen and a final speed of 120.947mph saw Stevenson wrestle victory away from his rival by only five seconds. Steven Procter took third ahead of newcomer Mike Browne, with Andy Farrell taking fifth. Brad Vicars crashed unhurt at Guthrie’s.